With the Network Diagnostic Tool (NDT), the user measures the performance of his/her connection and, more specifically, receives statistical data relating to its most important quality features: speed (throughput), Round Trip Time (RTT), jitter and packet loss rate. When conducting a measurement, the user’s computer communicates with a specially designed server having a high capacity connection and located at a central point of the network. By analyzing the communication between the server and the user’s computer, the afore-mentioned parameters are calculated and presented to the user. The duration of a measurement does not exceed 30 seconds. For using NDT, a modern browser is required that supports HTML5 and the WebSocket protocol. In the measurement page of NDT, users are asked to agree to the data policy before running a measurement. Then, by pressing the BEGIN button, the user executes a default set of measurements. At the start of the measurement, a set of controls are performed (firewall test, test for duplex mismatch detection, etc.). Measurements are done separately in the uplink and downlink directions; a typical measurement lasts 10 seconds in each direction. 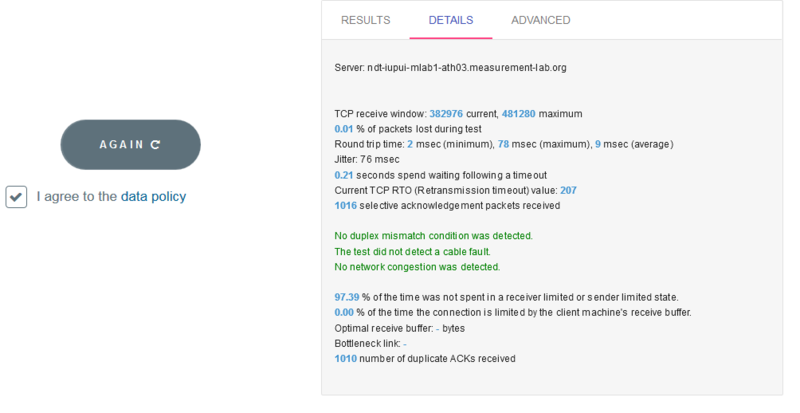 After the measurement is completed, the basic results are shown on screen: test server location, download and upload speed, latency (RTT), retransmission rate (packet loss rate) and jitter. Download and upload speed. These measurements provide an accurate (as possible) assessment of available bandwidth in the computer where the measurement is being conducted. It should be noted that for these values as well as the others described here, the measurement is based on user-server communication. The assessment therefore relates to the entire “path” between them, not only the user’s physical connection to the network. Fast speeds usually mean high speed downloads for the user. Since measurement is conducted using the TCP protocol, other factors which affect this specific protocol also tend to be visible from this measurement. In most cases, the slowest connection on a path determines the maximum speed that can be achieved. Round Τrip Τime (RTT). Defined as the time needed for a standard packet to go from user to server, and for the acknowledgement of its receipt by the server to arrive back to the user. Clearly, since the measurement comprises both directions, the RTT refers both to the uplink and downlink of a connection. The RTT is a great indicator of network quality, the significance of which is similar to that of upload/download speed. Lengthy RTTs may mean greater delays in interactive on-line games or other applications sensitive to this feature, such as VoIP telephony programmes (Skype, Viber, Facebook Messenger, etc.). In order to calculate RTT as accurately as possible, dozens of uploads/responses are sent in both directions, from which an average is subsequently taken. Packet Loss. In the vast majority of cases, packet loss means network congestion at some point of the path from user to server. It should be noted that even values of around 1% are an indication of a serious network malfunction. Jitter. This feature shows the range of values around which RTT (see above) fluctuates. For example, a variation of around 3 milliseconds indicates the gap between the highest and the lowest value for packet upload/response time recorded during the measurement process. Jitter may often reveal possible network connection problems. However it should be taken into account that it is based on the extreme values from a large number of measurements and is consequently not always a reliable qualitative criterion. After completion of a measurement, the user can see a more detailed report of the measurements, by clicking on “DETAILS”. The report includes values of TCP parameters (receive window, number of duplicate ACKs, RTO, etc.) as well as useful diagnostics, such as whether network congestion was detected. Finally, by clicking on “ADVANCED”, the user can see the values of the Web100 parameters recorded during the measurement. The system includes several controls in order to avoid recording measurements with non-verified user data. For example, it does not record measurements performed from mobile networks, from networks of fixed providers who have not registered their IP ranges with EETT, or from networks outside Greece. Υour IP address [x.x.x.x] is not registered by your ISP in the HYPERION database. Your measurement results shall not be stored. In case you are a subscriber of a Greek ISP, please report the problem to your ISP or to EETT. In this case, if a user makes this measurement from a fixed connection, the correspondent ISP should inform EETT about the IP ranges used by its customers, and the offered nominal speeds. Measurements would subsequently be stored. However, if the user makes this measurement from a mobile connection, it would not be stored. Υour IP address is not registered by your ISP in the HYPERION database. Unfortunately you cannot register, but you can still perform measurements anonymously. In case you are a subscriber of a Greek ISP, please report the problem to your ISP or to EETT. It seems that your current IP address belongs to an ISP different from the one of your selected connection. If you wish to register your measurements, select the correct connection from the list or set the correct ISP in the Settings of this connection. Usually, this problem appears when a user has created different connections (e.g. home, office) and does not choose the correct one before running a measurement. Additionally, when users have changed ISP and have not updated their account information. To solve these problems, users just have to choose the correct connection, or update their account information prior to the measurement.